"Following the recent successful albums of his transcriptions of music by Philip Glass, pianist Michael Riesman presents a new album of solo transcriptions and arrangements from Philip Glass's opera Beauty and the Beast. In Glass's music, the power of the creative and the raw world of nature, represented respectively by Beauty and the Beast, finally emerges and allows the world of imagination to take flight." "Italian guitarist Massimo Menotti showcases a recital of the most rigorous Minimalist music from the 1960s by Steve Reich and Philip Glass. Menotti records each layer of the music himself, performing and recording above the previously recorded tracks using all the various techniques that were pioneered by Reich and Glass, two founders of the Minimalist movement, including phasing and open and closed forms." 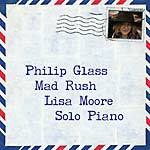 "On this release, Lisa Moore interprets iconic piano works from the catalogue of Philip Glass including Mad Rush, Metamorphosis Nos. I-V, Etude No.2, the finale from Glass's opera Satyagraha, and Closing from the Glass classic Glassworks. Moore is one of the preeminent new music pianists of her time, having played with or for the foremost composers and ensembles of the past half-century. Her journey to the solo piano repertoire of Philip Glass is propitious as there's a growing interest in this most intimate part of a very public composer's body of work." "Orange Mountain Music presents a new recording by the Basel Sinfonieorchester of Philip Glass's Symphony No.4 "Heroes" based on the music of David Bowie & Brian Eno. Composed in 1996, Glass took his departure from Bowie and Eno's beautiful melodies in crafting a six movement, forty-four minute symphony. This new recording conducted by Glass champion Dennis Russell Davies presents a shimmering rendition of this attractive and accessible work." "Orange Mountain Music presents a new recording by the Basel Sinfonieorchester of Philip Glass's Symphony No.1, subtitled Low, a work based on the music of popular music artists David Bowie & Brian Eno. Composed in 1992, Glass took his departure from Bowie & Eno's beautiful melodies in crafting a three-movement symphony. This new recording, only the second set to disc, is conducted by Glass champion Dennis Russell Davies and offers a shimmering rendition of the work." "This release from Orange Mountain Music features the Dublin Guitar Quartet performing string quartets by Philip Glass on classical guitars. The quartet performed in Ireland with Glass in 2008 and later produced a YouTube video performing Glass's Third String Quartet. The video was seen by Orange Mountain Music which immediately resolved to collaborate with the group. The recital presents Glass's quartets Nos.2, 3, 4 and 5 in arrangements by the members of the group themselves. The transcriptions are thoughtful adaptations that show unusual insight and understanding of the music." "Philip Glass's passion to unravel the mystery of what music really is has been present throughout his entire career. He has expressed this passion through his travels around the world, engaging with musicians of different ethnic and cultural backgrounds and creating new music with them. In 2012, Glass journeyed into the mountains of Mexico to interact with the Wixarika people. Concert of the Sixth Sun gives us a glimpse into this culture's unique world of mystery and spiritual beauty. Guitarist Roberto Carillo Cocío and violinist Daniel Medina de la Rosa are joined by the composer at the piano." "'The Raybeats went into Green St. Recording on June 4, 1982 with Philip Glass, Michael Riesman, and Kurt Munkacsi without really knowing what to expect. We wouldn't know what we had until thirty years later.' So begins the liner notes to The Lost Philip Glass Sessions, a set of seven songs by the instrumental neo-surf rock combo from New York City that arose from the no wave musical scene. The Raybeats' original line-up consisted of Don Christensen (drums), Jody Harris (guitar), Pat Irwin (guitar, saxophone, organ) and George Scott III (bass). New York City in the late-1970s and early 1980s was a place where the cross pollination of very different artistic streams was limitless. Three of these tracks feature keyboard arranged and performed by Philip Glass, and performances by Michael Riesman and the rest of the production team. The songs include 'Black Beach,' 'And I Do Just What I Want,' 'Pack of Camels' and a cover of the band's classic track 'Jack the Ripper.'" "Orange Mountain Music presents The Dance, a collection of works by composer Jon Gibson. Long-associated with the minimalist music scene, Gibson was a founding member and performer with the Philip Glass Ensemble. Steve Reich's 1967 composition 'Reed Phase' was written especially for him. Gibson has been working extensively in the world of dance. This program includes some recent and older dance pieces including commissions for choreographer Nina Winthrop and Dancers." In 2001, Philip Glass composed the music for the film Naqoyqatsi: Life as War. It was the last film in a trilogy by director Godfrey Reggio that featured only images and music. 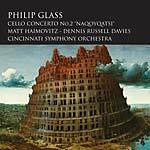 When the Cincinnati Symphony Orchestra invited Glass to be a creative director for its Boundless Series during the 2011-12 season, Glass thought of his cello concerto and its possible life beyond film. The CSO commissioned the Cello Concerto No.2 - Naqoyqatsi and gave the composer the opportunity to have it reborn as a proper concerto. The resulting recording is drawn from the live performances. This dynamic seven-movement work is conducted here by long-time Glass champion Dennis Russell Davies with soloist Matt Haimovitz." 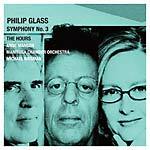 "In this new recording made at Canada's famous Glenn Gould Studio at the CBC in Toronto, conductor and Philip Glass champion Anne Manson leads pianist Michael Riesman and her own Manitoba Chamber Orchestra in a tour de force performance of Glass's Oscar nominated music from The Hours and a virtuosic performance of Glass's Symphony No.3. Riesman, conductor and pianist on the original soundtrack recording of The Hours, was commissioned in 2002 to create a concert piece based on the score. Glass's third symphony was written in 1995 for the Stuttgart Chamber Orchestra and is one of the composer's most performed and accessible concert works. This recording shows off the Manitoba Chamber Orchestra's versatility, especially in the quick paced second and fourth movements, as well as the ensemble's silky interpretation of the many-layered voices of the third movement, all under the precise direction of Manson." "In celebration of the 2012 revival of the seminal modern opera Einstein on the Beach by Philip Glass and Robert Wilson at the Brooklyn Academy of Music, Orange Mountain Music presents this world première recording of highlights from live performances at BAM in 1984, featuring the Philip Glass Ensemble and produced by Kurt Munkacsi. As a special bonus, the disc is paired with the film The Changing Image of Opera, available on DVD for the first time. This rare Chris A. Verges film documents the 1984 production of Einstein on the Beach at BAM." DVD run time: 58 minutes; NTSC all region format. "The idea for Rework came together during a conversation between Philip and his friend (and new collaborator), Beck. The pair recruited producer Hector Castillo (David Bowie, Björk, Lou Reed) to help assemble a collection of remixes of Glass' works by a list of critically acclaimed artists including Beck himself, Tyondai Braxton, Amon Tobin, Cornelius, Dan Deacon, Johann Johannsson, Nosaj Thing, Memory Tapes, Silver Alert, Pantha Du Prince, My Great Ghost, and Peter Broderick." "Virtuoso flutist Massimo Mercelli teams up with I Virtuosi Italiani and pianist Carlo Boccadoro to present a recital of works by Philip Glass. This recording features two world premières including Chaotic Harmony and Taoist Sacred Dance. Widely known in Europe, Mercelli is artistic director and founder of the Emilia Romagna Festival and tours regularly as a soloist, including two tours with I Virtuosi Italiani. Pianist, conductor and composer Boccadoro is a long-time champion of new music and has released prominent recordings of music by Glass and Michael Nyman." Featured works: Chaotic Harmony, Taoist Sacred Dance, Façades, String Quartet No. 3. "Orange Mountain Music presents the world première recording of Philip Glass' The Passion of Ramakrishna. Commissioned by the Pacific Symphony and premiered in 2006 during the opening of the Segerstrom Center for the Arts in Orange County, Glass' 45 minute oratorio, written for soloists, chorus and large orchestra, is a passion play and a tribute to 19th Century Indian spiritual leader Sri Ramakrishna. The work portrays his death with the chorus taking up the voice of Ramakrishna himself and the soloists are those of his loved ones, doctor and disciples. Maestro Carl St.Clair, a longtime champion of the music of Philip Glass, leads the Pacific Symphony, Pacific Chorale and soloists Christopheren Numura (baritone), Janice Chandler Eteme (soprano), Kevin Deas (bass), I-Chin Feinblatt (alto), and Nicholas Preston (tenor)." "Composed on commission from the Bruckner Orchester Linz, Carnegie Hall, and the Los Angeles Philharmonic, Philip Glass' Symphony No.9 receives its world premiere here on a recording from Orange Mountain Music. Written for large symphony orchestra with expanded brass and percussion, Glass' three-movement work received its US premiere at Carnegie Hall on January 31, 2012, Glass' 75th birthday. This recording is conducted by Glass' long-time collaborator Dennis Russell Davies, conductor and music director of the Bruckner Orchester Linz, Landestheater, and the Sinfonieorchester Basel, who has premiered all but one Glass symphony." "Philip Glass' one act chamber opera In the Penal Colony was composed in 2000. The libretto is by Rudolph Wurlitzer and based on a story by Franz Kafka. Scored for string quintet and two singers, this world premiere recording by the Music Theatre Wales under the direction of Michael Rafferty features tenor Michael Bennett as the Visitor and baritone Omar Ebrahim as the Officer." "Orange Mountain's fourth volume documenting the concertos by Philip Glass features the world premiere recording of the composer's 2010 Double Concerto for Violin, Cello and Orchestra, performed by violinist Tim Fain and cellist Wendy Sutter. The work originated as a commission from the Nederlans Dans Theater for a new dance piece choreographed by Paul Lightfoot and Sol Leon. It is an exciting tour-de-force with three orchestral movements enveloped in duets by the soloists. 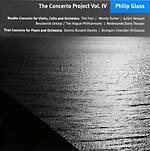 The second work on this disc is Glass's first piano concerto, the Tirol Concerto for Piano and Orchestra from 2000. It is performed by the Stuttgart Chamber Orchestra with Dennis Russell Davies as conductor and soloist." "Philip Glass' 2001 Concerto No.1 for Cello and Orchestra has a unique story. Following the terror attacks in New York in September 2001, Glass was discouraged from traveling in the immediate aftermath and consequently missed the world première of the work in Beijing in October with cellist Julian Lloyd Webber. It was not until 2007 that Glass had the chance to hear the work live in the concert hall when Wendy Sutter performed the US première in California. Glass encouraged Sutter to perform the work extensively and this recording was made during a tour with the Orchestra of the Americas." 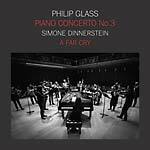 "In 1998, percussionist Jonathan Haas commissioned Philip Glass to compose a concerto. The Concerto Fantasy for Two Timpani has turned out to be one of Glass's most frequently performed concert works. Haas worked closely with Josh Quillen and NYU Steel to create the arrangements and recording of Philip Glass' piano Etudes on steel drums. The result is a fantastic re-imagining of Glass' music, giving new light to the color and structure of this very popular repertoire." "Pianos in the Kitchen, the fifth volume of Orange Mountain's series From the Kitchen Archives, features piano music played at New York City's famous venue The Kitchen. Performances include music by Philip Glass (Mad Rush), Meredith Monk (Traveling, Paris), Charlemagne Palestine, Anthony Davis (A Walk Through the Shadow), Harold Budd (Preludes for Solo Piano), and Dennis Russell Davies performing music by Keith Jarrett (Ritual for Solo Piano)." "The Music of Philip Glass & Foday Musa Suso is the sixth volume of Orange Mountain's series From the Philip Glass Recording Archive. Suso is one of the most prominent musicians to come out of Africa in the last forty years. This album re-releases the music that Glass and Suso wrote for the Jean Genet play The Screens and includes two live bonus tracks of Glass & Suso playing live in New York in 2009." "On this new set from Orange Mountain, the fast-rising New York-based ensemble Brooklyn Rider performs the complete works for string quartet by Philip Glass. The set includes the world premiere recording of a suite from Glass' score to Sean Mathias' 1997 film Bent, which starred Mick Jagger, Clive Owen and Ian McKellen. Most of Glass' string quartets are programmatic in nature. The second quartet was written for the Samuel Beckett play Company and the third accompanied Paul Schrader's film on the life of Japanese writer Yukio Mishima. The fourth is an elegy in remembrance of artist Paul Buczak. Glass' remarkable first quartet was an early work, written in 1966."